December 8, 2018, is the 10th anniversary of the F-18 jet crash in University City that took the lives of four members of the same family, destroyed two homes, damaged several others, and caused multiple fires. 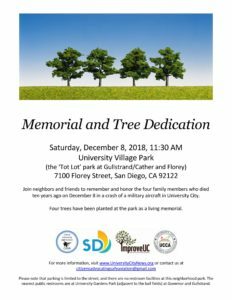 Neighbors will gather at University Village Park for an hour of remembrance and healing: to share memories, for a moment of silence and to dedicate four trees planted as a living memorial to those who lost their lives. 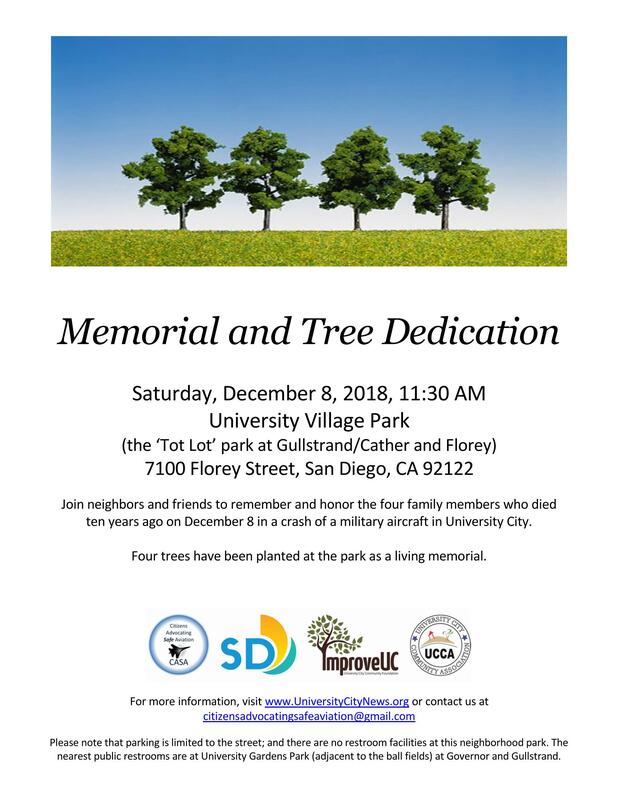 The Memorial and Tree Dedication is on Saturday, December 8, at 11:30 AM, at University Village Park (the Tot Lot park), at 7100 Florey Street in University City. The park is located at the intersection of Gullstrand/Cather and Florey. The public is welcome to join with neighbors and friends to connect with each other to remember the crash and its aftermath. Sponsors hope that by dedicating four trees as a living memorial to the four neighbors who died in the crash, the long process of healing will continue. 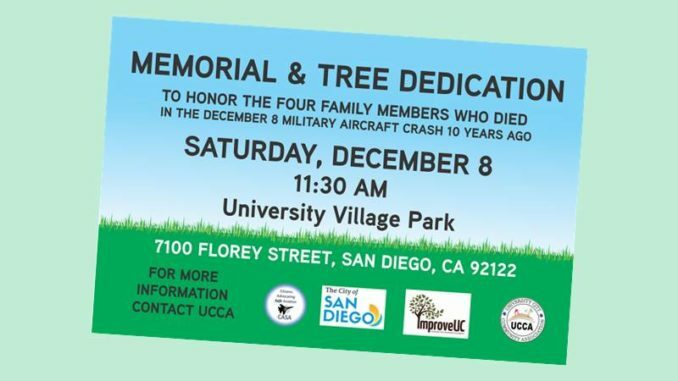 Neighbors who are not able to attend the Memorial and Tree Dedication are urged to set their alarms to alert at 11:58 AM on Saturday, December 8, as a reminder to participate in a moment of silence and to remember all those affected by the crash. Please note that University Village Park at 7100 Florey Street is a neighborhood park with no restroom facilities and no parking lot. There is limited on-street parking. Neighbors and attendees are urged to walk to the park if possible. The nearest public restrooms and parking lot are at University Gardens Park (adjacent to the ball fields) at Governor and Gullstrand. The four trees were donated by the University City Community Foundation; the City of San Diego will plant and maintain them in the park. Sponsoring organizations include Citizens Advocating Safe Aviation and University City Community Association. Contact citizensadvocatingsafeaviation@gmail.com.